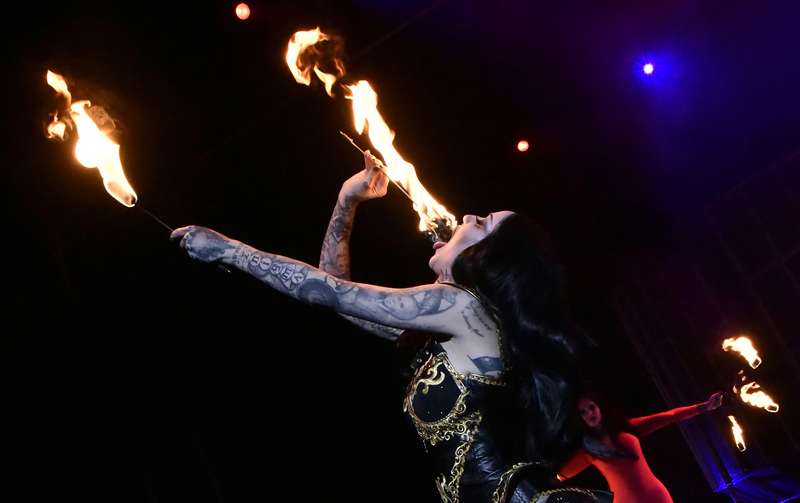 The circus is back in town, this time in the form of Cirque Infernal. It’s very much in the style of Cirque du Soleil where entertainers are drawn from around the world and all excel in one bizarre skill or another. We all love a good spectacle. Give us feats of strength and derring-do, pretty girls breathing fire and shirtless hunks walking the tightrope and the audience goes wild. 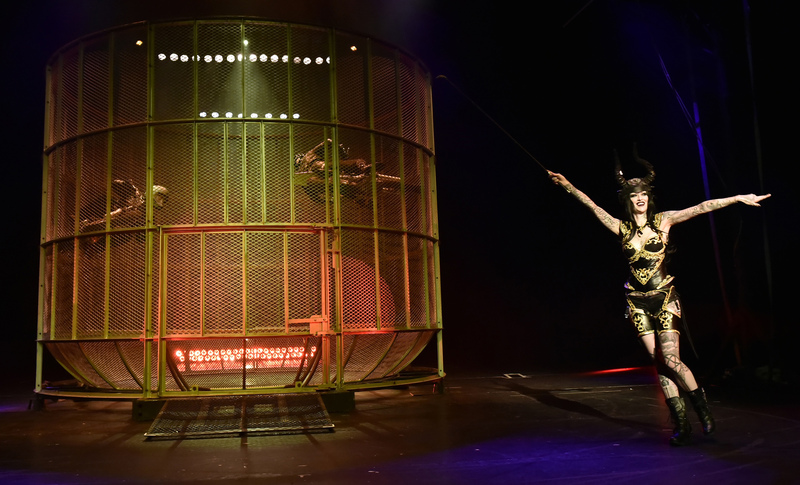 Yep, the circus is back in town, this time in the form of Cirque Infernal. It’s very much in the style of Cirque du Soleil where entertainers are drawn from around the world and all excel in one bizarre skill or another. It’s a sophisticated show with a variety of acts heightened by pulsating music for the thrilling parts, some Spanish rap for the funky parts or calming, melodious tunes to match whatever feats are being performed. The fabulous lighting creates a succession of moods and the artists are all superb. Well, I think that was the gist of it, but the Voice of Death was a little muffled and it added nothing except a rather dull opening sequence of sombre monks gliding around in the gloom. It also allows a couple of long-legged lovelies to swan around in very unangelic “angel” costumes while the devilishly provocative Shelly d’Inferno plays with fire as the Grim Reaper’s advocate. Still, this attempt to make a circus different by introducing a storyline rather than sticking with the usual format of a ringmaster, or just a succession of spectacular acts, doesn’t grab the imagination as it should. What does grab you, as ever, is the sheer quality of the acts. A highlight is the strongman duo of Romanian brothers Valentin and Catalin Badea, who have you watching in awe as they balance each other in a series of gravity-defying movements. Astonishing. There’s always a contortionist in a modern circus, and Ruslana Krutas freaks you out with movements that suggest her legs have lives of their own. Nobody ever admits to actually liking contortionist displays, but they’re always the one you gasp about at the interval. The only act to engage with the audience is the knife-throwing married couple, Rachel Irving and Charlie Peratt, with Rachel chatting to us through their performance. It’s a nice touch, drawing us in so we feel for the artists, rather than just admire them. This is an equal opportunities circus, and it’s great to see women playing powerful roles rather than merely fluffing around providing the pretty. Along the way come aerial acrobatics, a Sufi whirling dervish act that doesn’t excite, although it does give you time to admire the accuracy of lighting designer Jean-Marie Prouveze, and the delightful skeleton-suited Andriy Ruzhylo balancing on Rolla Bolla tubes and boards. The finale has heavy metal music pounding out as three dare-devil motorbikers swing around in the always-amazing Globe of Death. Cirque Infernal runs at Joburg Theatre until September 23. Tickets on 0861 760 670, or Webtickets.